Back in May, I bought two very small/young Greenspire Linden trees with designs on giving the art of espalier a shot with them in our #newoldbackyard. I initially trimmed/pruned them up to make them two-dimensional and they sat for a more than a month in the driveway in Elmhurst before we moved into Downers. Then back in July, I posted a few photos that showed these Lindens in their containers awaiting their final position as our new fence went in. Once the fence was in, I was able to plant them in their final locations, along the south property line, butted right up against the cedar fence - which in this part of the yard is 6'+ tall. There were additional steps including the installation of the posts for the espalier system back in the beginning of August. I sunk 3 steel posts in the ground in preparation of the wire system. And that leads me to this post and an update on the process. After a few trips to Menards and some thinking/cogitating, I was able to figure out how I wanted to tackle the espalier. My goal was to set up guide wires that were taut but also allowed for tweaking along the way and wouldn't bend the posts inward towards each other. I also wanted to avoid trying to fix/connect them to the fence in any way. The fence posts are sunk 48" down in concrete piers, so they won't be moving/heaving during the winter. But these espalier posts? They're just 24" in the ground (by design), so I suspect they'll heave a bit in the winter. 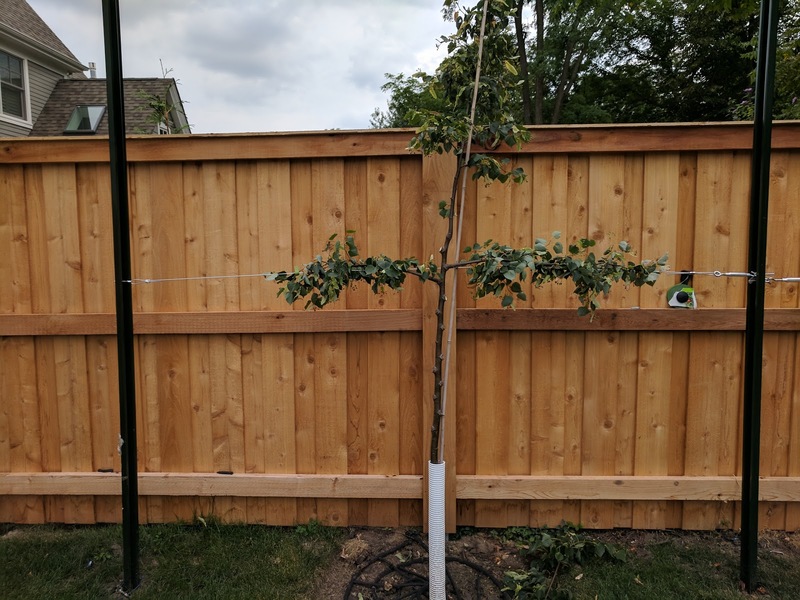 I didn't want a fixed fence connect to a moving set of posts - despite the alignment that connecting the two together would give me. Took one afternoon, but I was able to get most of one done. Here's a look at some of the in-progress shots. Here's the first course of the espalier trained on the galvanized wire (below) that is hung between two posts. 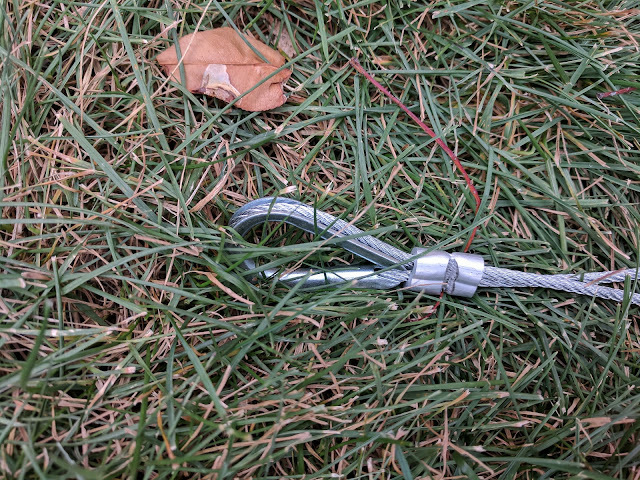 I used turnbuckles and other fasteners to make the connections. Below is a look at some of them. I repeated this up a few feet and intend to have four 'levels' of trained branches on each one. Once the limbs stretch out, I am thinking about trying to train it into a candelabra shape of espalier, but that requires long limbs that I can turn vertical when they reach their desired length sideways. These are nice additions to the #NewOldBackyard Arboretum and will add some interest to the fenceline. At each end of the wire, I terminated it with a loop and stop - which I was able to pick up at Menards. 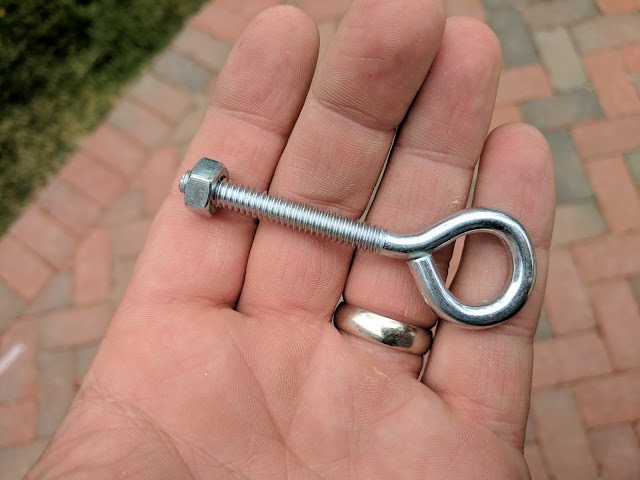 In order to crimp the stops on the wire, I had to buy this tool from Menards for $19.99. It looks an awful lot like a bolt cutter. 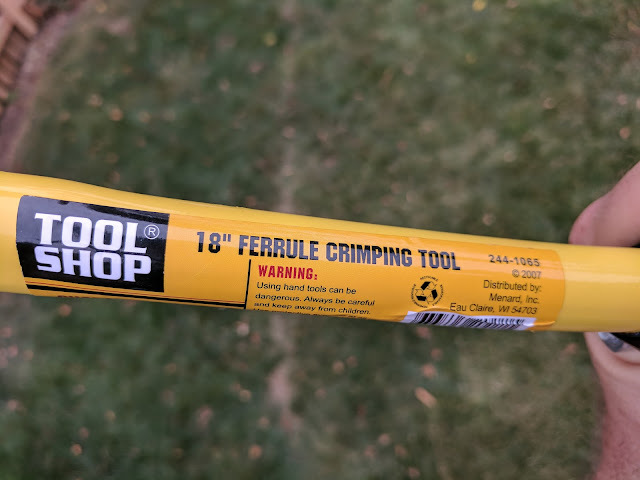 But, it is labeled a 18" Ferrule Crimping Tool. It is located right by the wire and stops/thimbles. And I must not be the only one who thinks this thing resembles a bolt cutter. 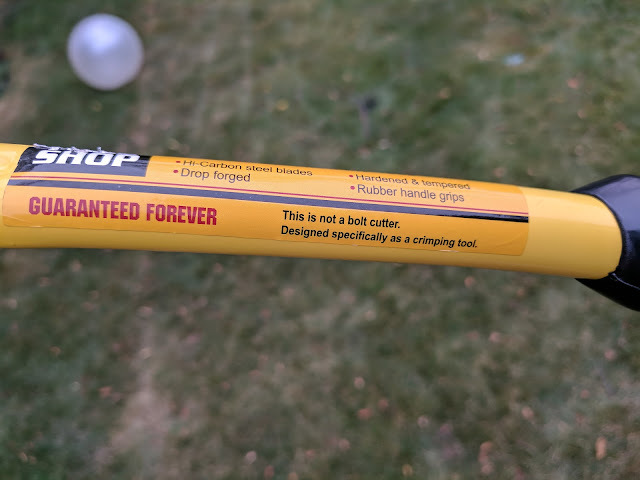 Because....right on the bottom of the label it says this: "This is not a bolt cutter. Designed specifically as a crimping tool." Nice labeling, right? The last piece was connecting the loops/turnbuckles to the posts and after trying various hooks, I ended up settling on these 3" eyebolts. The nut and a few washers give me the flexibility to tighten/loosen the eyelet to ensure I have the right tension. Once I get the entire of one of these Linden's espalier'd (or both! ), I'll post another set of pictures. It is clear that this is a story of patience as the limbs are currently very short (other than the lowest ones), so it will take a few seasons to make this work how I'd like it to work/look. But, guess what? I have the time!